Happy Holidays, Merry Christmas and Happy New Year! We wish you joy, happiness, health, love and success! May your realty goals become reality! We love this time of year! Homes show beautifully at their holiday best and invite warm and happy feelings. Most buyers looking are serious and ready to buy! 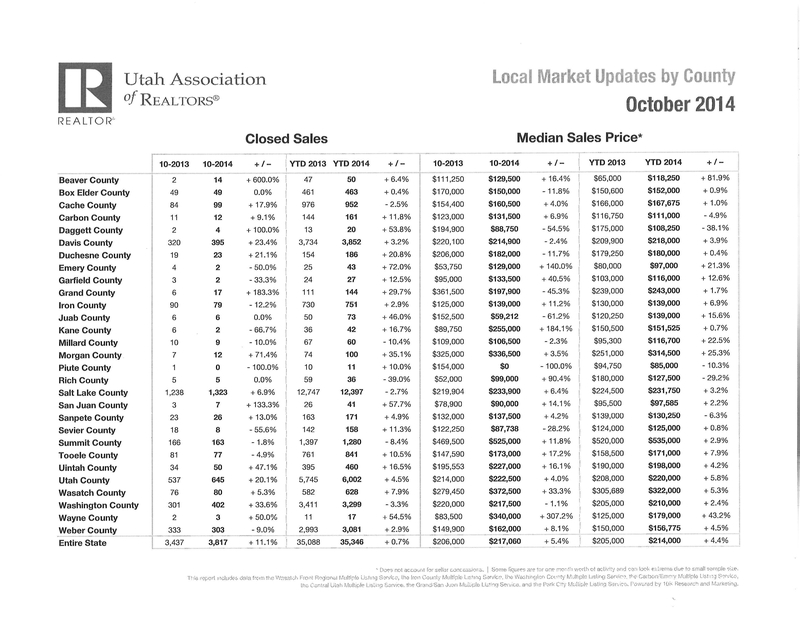 The Utah Association of REALTORS (UAR) Local Market Updates by County are attached. Since it takes UAR approximately 2-3 months to compile the statistics, the October 2014 report is the latest and includes information for every county in Utah. Iron County closed sales are up year to date (YTD) 2.9% in 2014 as compared to the same period of time 2013. The Median Sales price in Iron County is up 6.9% YTD for 2014 as compared to 2013 YTD. It is now $139,000. This coincides with our statistics that show more homes in Iron County are selling in the lower price ranges. Since we are a low income area, that is not surprising. Obviously, buyers are still getting good deals for homes in our area even though the Median Price seems to be on the rise. Homes are selling in all price ranges when priced correctly, but higher priced properties do not attract as many buyers due to the need to qualify for the loans. Interest rates are still very low, and monthly payments are sometimes lower than rent. Commercial and acreage are slow sellers. Developers are not in the market. Investors are looking for multi-units and single family homes. There are way too many lots for the number of buyers available, but bargain prices are attracting buyers and new construction. We are still seeing multiple offers on homes. Please remember that the “Seller Calls the Shots on Multiple Offers” as pointed out in the November/December 2014 REALTOR Magazine. “In any multiple-offer situation, it’s the seller, not the listing agent, who calls the shots.” “The listing agent’s duty under Article 1 of the Code is to ‘protect and promote the interests of their client’ and to “treat all parties honestly.” The seller makes the decisions not the agent. When more than one offer comes in on a property, the agent must present all of them to the seller. The agent must let the client know that they have 3 choices and provide a form for sellers to sign showing they received that information as required by Utah: 1. The seller can counter one and reject the other. 2. The seller can counter both of them as long as they use the Utah form that allows the seller to choose which offer they want if they are both accepted. 3. The seller can request highest and best offer from all parties by a certain deadline. The sellers’ right to choose which offer he wants is gold. He doesn’t even have to choose the highest one if he doesn’t want to. Janet is an example of that. When she sold her home in Oregon, she got two offers. She chose the one that wasn’t quite as high as the other because they were friends who really needed a home. As said above, the sellers’ right to choose is gold! Please remember that pricing and how properties look are of utmost importance in getting top dollar quickly. Please feel free to consult with our team regarding value and making sure the property is in show-window condition. Please do not count on assessed value being the sales price. There is a reason why owners challenge their assessed values. They are not always accurate. Sometimes they are higher than the property will sell for in the current market. The home or property is worth what a buyer is willing to pay, and the market decides that. If the market rejects your property at a certain price, it is good to consider a reduction. If you didn’t get your newsletter last month, please allow me to share the exciting news that Mathew Bagley just received the REALTOR OF THE YEAR AWARD from the Iron County board of REALTORS and Heather Roundy, ERA’s Broker, received the BROKER OF THE YEAR AWARD! We are thrilled for both of them. What an honor! Please call for your free real estate consultation: The Naisbitt-Bagley Team, 435-865-1019, ERA Realty Center including Matt Bagley (435-590-8788), Jennifer Corral (435-559-0366), Janet Naisbitt-Bagley (435-559-7772). We love to answer your questions and concerns. We work hard for you! You can email us at naisbitt@inxsnet.com or text our mobile numbers above.